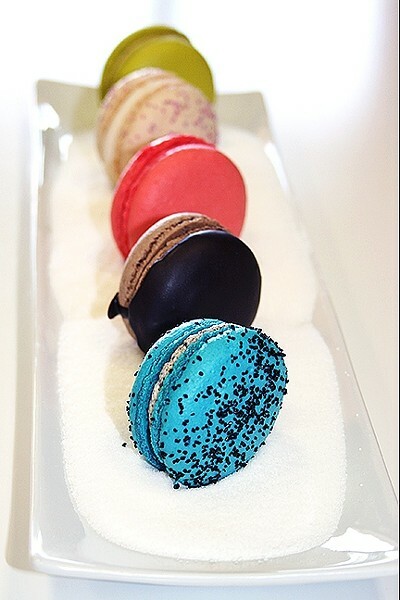 Believe it or not, the perky, rainbow colored macarons so many of us love to Instagram, were not, in fact, born in France. Sacre bleu! I’ll let that sink in for a moment. These iconic meringue based cookies composed of egg white, icing, sugar, almond powder, and coloring actually originated in Italy (in fact, they’ve been made in Venetian monasteries since the eighth century A.D.). 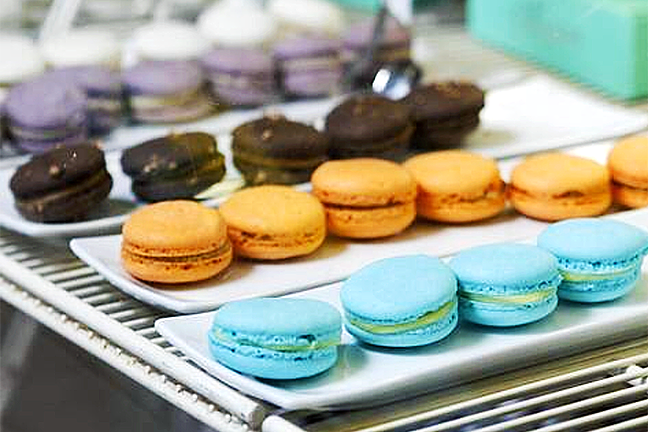 EAT THE RAINBOW: Macarons of all flavors and colors beckon at Pardon My French Bakery in Grover Beach, formerly Lickity Split Bakery. Although little has changed from then to now in terms of ingredients and style (those cute, ruffled edges; that airy texture that seems to dissolve on your tongue; a center filled with mild ganache, buttercream, or jam), there are plenty of modern-day chefs flinging the desserts into the 21st century with gusto. Case in point: Lalo Tejeda, who co-owns Pardon My French Bakery in Grover Beach alongside his wife and business partner, Jamie Tejeda. Here in this clean, bright bakery located within the busy Grover City Plaza shopping center, the chef is churning out exciting versions of the now decidedly French delicacy. On a recent visit, I caught glimpses of a shockingly chartreuse pistachio flavor, a blushing rose option, and—of course—the Fat Elvis (peanut butter, bacon, banana). Among the glass case sprinkled with cupcakes and bars, you’ll also find flaky croissants, Parisian brown butter pound cake, and sumptuous verrines—small bites served in a glass cup. That’s right, folks. Lickity Split Bakery has gone to the French side, revealing a new name and French-forward menu this month, a year after opening on May 5, 2016. Why the change? 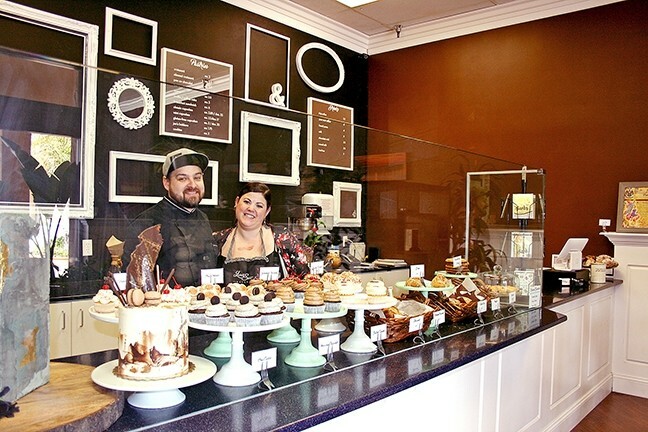 THE TASTY BUNCH: Lalo and Jamie Tejeda of Lickity Split Bakery in Grover Beach celebrated one year in business with a French-forward menu makeover and new name, Pardon My French Bakery. Even if this might be true, the new space really does feel akin to a living room, with a vintage stove in the corner and an old Pillsbury Dough Boy figurine overlooking a chill lounge area. Jamie and Lalo have certainly gotten all that, including an all-white, modern dining area and dog-friendly patio. Art from local artists dots the walls of the space. The remodeled bakery represents both of the couples’ strengths: She is the organized face behind the counter; he is the hardworking baker behind the scenes. Born and raised in San Luis Obispo, Jamie went to Cal Poly to study event planning, eventually working in the wine industry. She met Lalo, a Lompoc native, in 2011, and sparks flew. After a stint at Minnesota’s Cordon Bleu to study pastry making, the couple set their sights for Santa Rosa, Calif. There, he worked at Michelin Star restaurants and even had an opportunity to take on a temporary role baking at the famed French Laundry. Jamie worked in the winery scene in Calistoga until—as it often does—an urge told her to come back home. THE TASTY BUNCH : From front to back: passionfruit, double chocolate, rose, Fat Elvis (peanut, banana, bacon), and pistachio macarons at Grover Beach’s Pardon My French Bakery. What to do next? The couple brainstormed an ever-rotating list of culinary ideas: a cookies and milk truck, a breakfast and lunch space with cooking classes held once a month, the list went on. “We got married in January of 2016, came back from our honeymoon, and someone immediately said we should go check out Lickity Split; that the owner might be selling,” Jamie said. Although it would have been nice if that were the case, it wasn’t so easy. The couple was interested, but the previous owner, Jan Evans, wasn’t immediately excited about the idea. After several sit-downs where the trio talked about their love of desserts, dreams, and the area, a change began to stir. “We got to know each other on a personal level, and she found that this would be a good fit for everybody. She said she would regret not selling it to us,” Jamie said. PARDON MY MUNCHIES: Stop by Pardon My French bakery in Grover Beach for an assortment of breakfast pastries like scones and muffins as well as gluten free cupcakes, French pastries, and custom cakes and desserts made to order for weddings, birthdays, or what have you. You can also sit back with free WiFi and a hot Chemex pour-over (they won’t kick you out, promise). The bakery is located at 1544 W. Grand Ave. For more information, call 481-3255, go to pardonmyfrenchslo.com, or find the business on Facebook. Hours are daily from 8 a.m. to 6 p.m. and closed Wednesdays. Lalo now continues Lickity Split’s five-year tradition of crafting specialty cakes made-to-order, including elaborate and tasty wedding cakes and confections. You didn’t hear it from me, but word on the street is that the chef will craft anything you ask him to make, so feel free to bring your wildest desires to the table. If that’s not a good reason to stop in to this charming little spot, I don’t know what is. Sandwiched between a vacant property and a Radio Shack that’s going out of business, this French flower has grown defiantly between the cracks in Grover Beach’s sandy sidewalk. Hayley Thomas Cain is going to France to eat macarons galore. She can be reached at hthomas@newtimesslo.com.